Mystery birds are fun to investigate because they force us to look at the clues that are given us, even if the clues are few and far between. We don't always get a good clear view of a bird so often we have to identify the bird with whatever tidbits of information were provided. Like this mystery bird. All that's there is a head and a half belly of a medium-sized bird on a tree. We quickly liken the red cap to birds we know well, like a male Hairy or Downy Woodpecker. But we can rule them out, including the juveniles, because of the patterning on the belly. Hairies and downies of all ages have a clear white belly. After breeding and before molting, adults may have a worn, dirty belly, but not patterned feathers. We often rely too much on colors but this mystery bird gives us another clue: posture. This is a clinging bird, one that is able to hang on the side of a tree. Not all birds can do this. American Robins and other thrushes typically don't, Gray Catbirds don't, flycatchers typically not, and so on, ruling out many medium-sized birds. And even if we've never seen our mystery bird before in our life, we do recognize that its posture is like the woodpeckers that do frequently visit our yards and trees. With that clue in hand, we have a starting point - we start our search in the woodpecker section of our bird guide. Knowing where the bird was seen is important - we shouldn't waste too much time trying to turn this upstate New York bird into a Ladder-backed Woodpecker which is only found in Texas, the southwest states and Mexico. Sure, birds have wings and birds are sometimes found outside their range, but we should start with the most likely birds and venture into rarities only if we rule out the likelies. My particular eastern bird guide shows 12 birds in the woodpecker family. We've ruled out hairy, downy, and can quickly rule out another 3 far out of range, and of course it's not a Pileated Woodpecker of any age. So we're left with 6 possibilities. The speckly head just doesn't look like the clear head of a Red-bellied Woodpecker or Northern Flicker, and flickers, though they can cling, are most often seen on the ground. And we can rule out American Three-toed Woodpecker and Black-backed Woodpecker because of the red on the head, plus as birds of the boreal forest, these two species are very unlikely in our area. Again, stick with the most likely birds to be seen. So we're left with Red-headed Woodpecker and Yellow-bellied Sapsucker. Because of the time of year - September - we know we might be dealing with a juvenile bird wearing very different plumage than the adult bird. It's clearly not a red-headed adult, but the red-headed juvenile doesn't have that namesake striking red head. But it's pretty uncommon. We've got to more strongly consider what's more common. Which leaves us with Yellow-bellied Sapsucker. Even looking at field guides without images of the juvenile, we can pretty safely arrive at this conclusion, but if your guide shows it, like my Stokes Field Guide, all the better! As a juvenile, it will keep this plumage into the winter. They're very uncommon for us in winter, but even when a juvenile like this returns next spring, it still might not have full adult plumage. I hope this little post demonstrates that we don't have to throw our hands up in frustration when we get a poor view of a bird. There are always SOME clues! We can take those "lemon" looks and use what we DO have to make "lemonade"! Once the nesting season is over for birds, many promptly start a molt of some or all of their feathers. Birds will lose feathers, many of which are worn and tattered from the rigors of raising young, and those feathers will be replaced with new feathers. While birds are molting, they take on a disheveled look, while old feathers drop and new ones push their way out. But this process is necessary for birds as a well-functioning coat of feathers is critical to a bird's survival. You may see birds in varying degrees of molt for the next couple months. But don't look for the American Goldfinch molt just yet - they're still busy breeding and all their energies are directed towards that. They'll begin their molt after child-rearing is done and they have energy to put into growing a new coat of feathers. Nesting season amongst our common backyard birds is definitely nearing the end, but there are still plenty of young birds to be seen in our yards. A buzzy "zhee-zhee-zhee" call may alert you to fledgling Tufted Titmice begging for their parents' attention. Young Common Grackles lack the iridescence of the adults and will appear in your yard as dull brown birds. Very young grackles have a dark eye; this one has already transitioned to that characteristic grackle beady yellow eye. Many yards in upstate New York host Dark-eyed Juncos during the winter, but never get to see them during the summer. We're at some elevation and lucky enough to have juncos year-round. That means we get to see the young ones! All those streaks will molt into the solid gray and white plumage we're all so familiar with. This young bird most likely will not winter in my yard though; it will head to lower elevations and more northerly-breeding birds will be the ones that fill my yard this winter. Time is running out for observing young birds in area yards. Before we know, many will be indistinguishable from their parents while others will start the long flight south to their winter homes. So take time now to enjoy the young birds in your yard!!! After having spent 20-23 days in the nest as eggs and nestlings, young Northern Cardinals are fledging and beginning to follow their parents into your yard. Both mom or dad will feed the young, so watch for a tan bird tailing an adult cardinal. All young cardinals - male and female alike - will have a crest (sometimes not fully filled in) and will have the coloration of an adult female: light tan with some reddish shades. But to pick out a young bird, check out the beak. Instead of the bright orange beak both adults flash, a young cardinal's beak will be dark. Sometimes very dark, almost black, and sometimes lighter and tannish. But it is not orange! Enjoy this differentiation while you can. Cardinals molt in later summer or early fall, and by winter, the juvenile males will look just like dad with a beautiful red coat of feathers, and all their beaks, young and old, male and female, will be orange. Well that didn't take long! Just a few days ago I posted to look for woodpecker parents carrying mouthfuls of Bark Butter back to the nest. And now the young are starting to show up in the yard! Hairy and Downy Woodpecker fledglings have probably already been out of the nest for a few days by the time you see them in your yard. During those first few days, they stay close to the nest location and are still fed by mom and dad. But now's the time to venture a bit further and for mom and dad to show the young where to find food, hopefully at your birdfeeders! Hairy and downy parents will bring their young to the area around your birdfeeders at first, so keep an eye on nearby trees. Young birds will wait there for a parent to bring them a beakful of food. Watch closely and you may be lucky enough to see a parent feeding a young bird. After a few days, the young will join the parent on the birdfeeder and soon after that, the young bird will start picking at the food as they learn to feed themselves at your feeders. Young woodpeckers will be almost full sized birds and oftentimes are larger than their parents who have lost weight while tending to young in the nest. Young birds will show clean, unworn feathers. Their parents, on the other hand, look a little unkempt. The parents' feathers look worn (think of all those trips in and out of the nesthole!) and the white feathers can look a little brownish from the tannins in the tree. Young birds will look somewhat fluffy, especially on their head. If you see a patch of red on the top of a Downy or Hairy Woodpecker's head, it is a young bird. If it's a male, the patch will reappear on the back of his head (just like dad's) after his first molt. Watching young birds is so enjoyable. Power up your observation skills and enjoy their antics! During early June in upstate New York, Mourning Doves have most likely had at least one brood of young. Within a week of leaving the nest, the young will be on their own, foraging under the birdfeeders with all the other doves. To pick out a young bird, look for buff edges on their wing feathers and/or breast feathers and possibly a shorter tail. And even as we welcome young doves to our yards, you can look for adult birds engaged again in courtship and mating behaviors. Doves breed early, and can have multiple broods each breeding season. This young male Northern Cardinal was well camouflaged amongst the turning sumac leaves. He's beginning to molt here and will emerge with a beautiful coat of red and a bright orange-red beak. Image taken in early October in upstate New York. 1. Once migration starts, the Ruby-throated Hummingbirds you see today will most likely be replaced by a new group of hummingbirds tomorrow. 2. Adult males typically depart first, with adult females and young birds following. Unfortunately, it's often difficult to tell these remaining birds apart. 3. 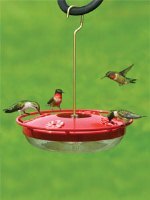 When you watch hummingbird behavior closely throughout the summer, you can become familiar with the behavior and preferences of your resident hummingbirds, like what feeders they frequent most and where they perch. With that knowledge, you can more easily notice when your resident birds have departed and have been replaced by migrating hummingbirds that behave and visit feeders differently. 4. Keep feeders clean and nectar fresh so these migrants can easily locate high quality nectar sources. Fill feeders only halfway when activity slows down so you're not throwing away a lot of nectar. 5. Keep your hummingbird feeders up and filled with fresh nectar for at least two weeks after you see your last hummingbird in the fall. I like to keep at least one feeder up well into October, in case a wandering Rufous Hummingbird were to be in the area. Hey, you never know, but if one does, I want it to stop in MY yard for a nectar source. 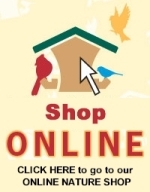 FAQ: Can I Keep Bird Feathers I Find on the Ground? Q: Can I Keep Bird Feathers I Find on the Ground? A: No, It is illegal to keep the feathers of most of our native birds. The Migratory Bird Treaty Act of 1918 was put in place to protect birds, and it "makes it illegal to take, possess, import, export, transport, sell, purchase, barter, or offer for sale, purchase, or barter, any migratory bird, or the parts, nests, or eggs" of native birds unless you have a permit to do so. That includes feathers found on the ground, nests even after used, and eggs that never hatched. They are interesting and informative to look at, but all should be left as you found them. It's late summer, breeding season is wrapping up, and birds are starting to molt, replacing their worn out feathers with new fresh feathers to face the winter ahead. And as I walk my yard, I find many of their spent feathers littering the ground. Many of the feathers are quite worn while others are in seemingly great shape. But they're all beautiful in their own way. Some are easy to tell what kind of bird wore them, others I just can't tell. I imagine many are from adult birds who have just finished their nesting season. Oh, the stories those feathers could tell! But the rigors of breeding can be rough on a coat of feathers, and with winter ahead, feathers need to be in tip top shape. So out they go, methodically (most of the time) dropping out while being replaced with pristine new feathers. The outcasts temporarily mark the bird's presence before breaking down and returning to the earth. So until then, I let the feathers lie, enjoying that splash of color in the grass or the movement created by a downy feather waving in the breeze.